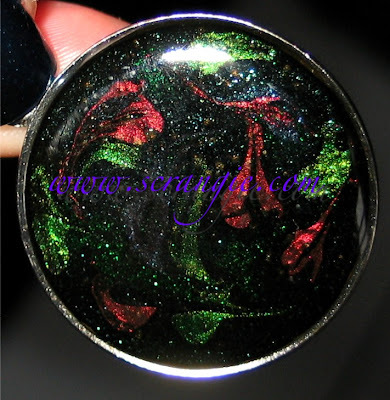 Here's my pendant made with China Glaze Emerald Sparkle. I think I wear this one the most often because it's really eye-catching with all that glitter. 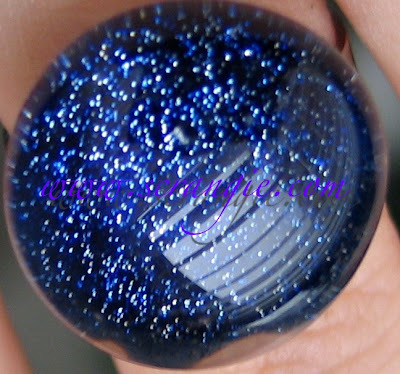 Here's a custom piece made with a combination of China Glaze, Rimmel and OPI. 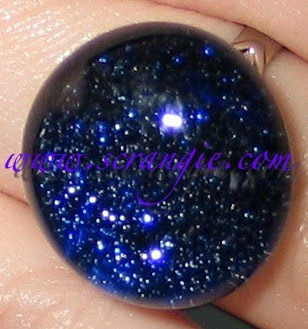 Another custom pendant, isn't it fascinating? Kinda looks like flames to me! 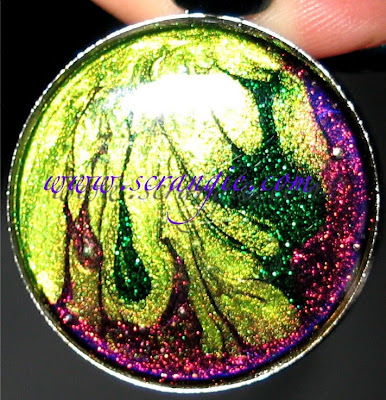 Third custom pendant, very cool swirling design on a gold metal finish. 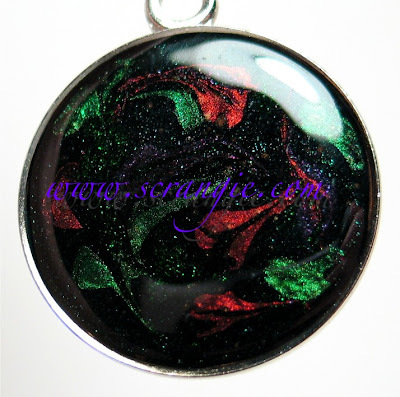 The pendants come in a variety of shapes, but mine are all the large circle shape on a silver metal base. 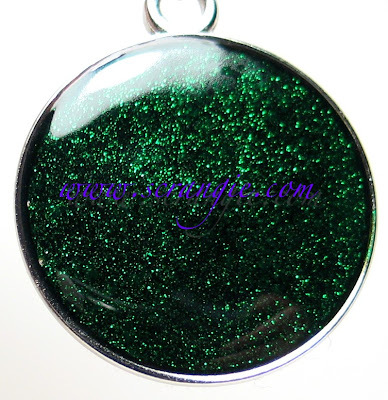 The plain polish pendants come with a chain, but the custom ones do not. I switched the stock chain out of one of mine and put it on a different one and it looks great. All of these pieces are from Ginger Kitty Designs on Etsy. She does do things other than nail polish jewelry, but here's the polish jewelry section of her Etsy store . Everything is made to order so there's about a one week turnaround time. This is a cool gift idea for a polish lover. It's hard to buy polish for someone who already has a huge stash, so I'm sure they'd really be surprised if they were presented with a pair of earrings made of their favorite polish. 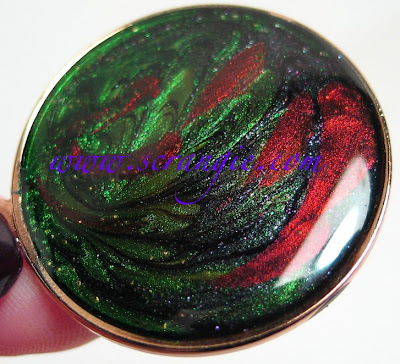 My favorite thing is the ability to pick all your favorite colors and have them swirled together to create a one-of-a-kind piece of jewelry. 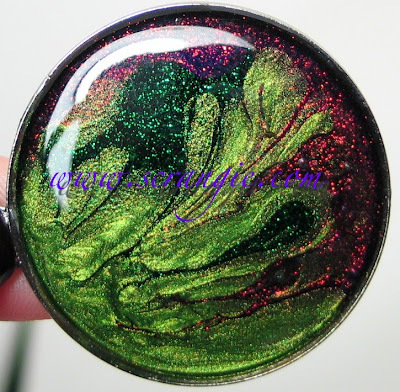 Also... Tracey, proprietor of GingerKittyDesigns is graciously offering a discount code in her shop for my readers. Use "SCRANGIE" in the notes to seller at checkout to get 25% off of anything over $25 plus free shipping (and hey... how about that... the polish pendants are over $25!). The code will be valid until December 19th (which is the cutoff date for being able to receive your items in time for the holidays). If any of you do end up ordering some custom pieces, please send me pictures! I'm dying to see everyone else's custom designs. Scrange, this is amaziiiiing! I will definitely be ordering! B, aren't they soooo cool?!? I think I want to do a black/silver/purple one! Jenny, I issued you a refund :) Anyone who wants to place an order, just mention the code in the "notes to seller" and do not pay, I will send you an updated invoice with the discount! Do we send in the polishes or is there a list to choose from? These are amazing! Scrangie, it is great that you are positing about these wonderful creations! Love your blog BTW! I am so happy for you Tracey...I posted a link over on Majyk for everyone to see. Thank you so much! I cannot wait til PayDay! Wow, those are so creative! I would love to learn how to make those. I've been reading your blog for a while now but I've never hard the guts to comment here! I ADORED the ring and I wish I could order one, but my Christmas internet shopping is already dedicated to nail polishes. I'm from Brazil and it's the first time I'm buying those, but I hope everything turns out well. Most of my decision of buying them was after hours of reading your blog, going through pages of photos and reviews of colors I would never dream of. So thank you! Wow, those are GORGEOUS! 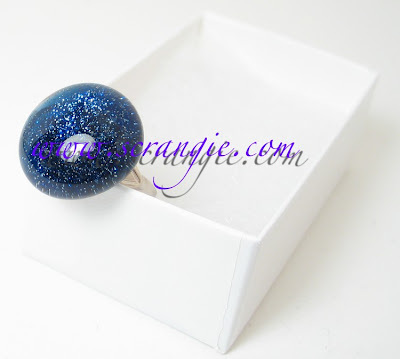 I especially love Starry Starry Night's ring! Thank you Tracey! That was very nice of you! Beautiful jewelry! O.M.G! I love, I love, I love! I definitely need to place myself an order! I LOVE that ring! The Third one is just gorgeous! I love these so much! It's amazing how much cool stuff you can find on Etsy. My favorite is the blue Essie ring, it's absolutely gorgeous.